I believe in Schuyler Towne. 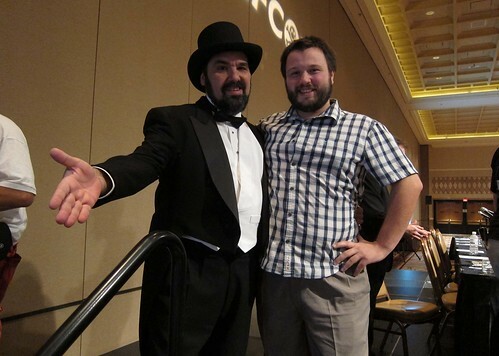 I believe in him enough that I spontaneously decided he needed a classy intro at his DEFCON 19 appearance last year. And I believe in him enough that last week I announced I was heading up a board of folks to close out his failed kickstarter. If you don’t know Schuyler, he is one of the most engaging and interesting people I’ve met. He’s well spoken, he’s talented in the world of locks, lockpicking and historical knowledge about both, and he’s done some amazing things. In 2010, he announced a kickstarter to fund the making of some picks. He asked for $6,000. He got $87,000. This should have heralded a wild success. But, as some people know and now you do too, it did not. Schuyler quit his job to finish the project full-time, and spiraled into a terrible mess, one which has ended with him checked for periods of time in a mental hospital, taking meds, and ultimately losing his apartment as of the end of this month, August 2012. Some percentage of the kickstarter rewards have been bought, the photos of which are here. He capitulated and has let this multi-member board take over the process, and after the inventory that has gone on, the next step is to ship what Schuyler does have out to his backers. These are T-shirts, practice locks, cases for the to-be-made picks, as well as other similar items. They’ve been bought, they’re made, they’re sitting in his home with him catatonic over the fact he can’t send out complete packages. We’re ice-breaking this, and sending out everything he does have, to get them out of his house and into the hands of people who paid into the kickstarter. Another set of people within the board are working to get those picks made. They’re dropping money to help that happen, so that ultimately this project can be closed out. To do this, I am going to travel to Boston and personally mail out all the rewards in his possession to the people who are owed them. To do this, I am going to spend a few thousand dollars. This is not money I would prefer to spend, but as I said, I believe in Schuyler. He is seeking employment and hopes to pay me back down the line. He loses his home at the end of the month and is moving in with his parents, seeking help and insurance to pay for his medications. He is in bad shape. I hope he comes out of it well. Until then, I want this weight, this miserable weight, off his shoulders so he can heal. It’s significant cash. It’s money I really can’t just pop out of thin air. Therefore, for a short time to come, I am going to gear ALL proceeds from the sales of my documentaries into paying for Schuyler’s postage. If you want to contribute money towards this endeavor, then please consider buying one of my films. I made two great documentaries on computer history, and if you buy them, you get some real nice stuff, as that page shows. So you’re not just doing a donation, you’re getting something – it’s me who’s choosing to dump this money into postage. Because, again, I want this kid back on his feet. It was slightly different circumstances, but I started a business in 1995, an ISP, that went south quick and ended with me owing thousands in debt. I got a job, paid everyone off, but until then I was wrecked. I know the feeling. If you’re inspired to do a straight donation, I’m up for that as well – write me at jason@textfiles.com. Every penny goes to this postage bill. If you’ve enjoyed his videos or his presentations, then this would really help things. This funding drive continues to August 25th, 2012. If you need help with mailing or transporting, I’m here. Schuyler is indeed a great guy. I’ve attended a number of his presentations and have had the opportunity to chat with him on several occasions. His depth and breadth of knowledge of locks and locksport is encyclopedic and his enthusiasm is infectious. Thank you and the rest of the board, for helping him out in a time of great need. You have proven again and again that you are a Man amoungst men. This simply stands to reinforce that fact. I wish Schuyler all the best in his recovery and you the best of everything. Always. Please let Schuyuler know that some of us are sympathetic to his cause and situation. I wish him well. Do not schedule me for any part of the split shipment. Save your postage for the picks. Thanks for this Jason — Schuyler’s an incredible person and I’m glad he’s got some truly good people backing him up. Let him know that we’re all rooting for him and wishing him a speedy recovery. Having been in a state of extreme clinical depression I can understand where Schuyler is at and sympathise with him completely. I can only advise him to hang in there because it will get better. I feel sad, and I apologise for getting political here, that Schuyler lives in a country that does not have an enlightened approach to health care for all its citizens and which thinks corporate profit is more important than the welfare of its people. Sermon over. If there is anything I can do to help I am happy to do so, even if it is only to kick in a few more dollars to help cover postage costs. Thank you for helping out someone you believe in. That goes for you and the rest of the board. I’m hopeful for Schuyler’s ongoing successful treatment, and am so glad for the support you guys are providing. It’s truly inspiring. Ditto on Raymond’s comments. I am a backer and I believe in Schuyler Towne! I understand why some are upset after their donations and the elapsed time; however, I purchased backing of a brilliant idea by a brilliant guy. What I didn’t purchase was a tried and true product from a well established company. I’m sorry that some backers just can’t grasp that concept. I’ve been silently waiting and reading posts for the better part of 2 years and I still believe that this concept can work. C’mon people – this guy opened a car door with a popsicle stick! I would still love to get my hands on a set of these picks, but I understand the circumstances. Jason, I know you will continue to keep us posted on events with the pick production and most importantly, Schuyler’s well being. Thanks to those that have taken an active role in helping a friend in need. You all deserve a round of applause. That being said, please keep in mind the fundamental concept here – you can purchase decent picks from many places on the web. What you can’t currently purchase are “Locksport” grade picks. I’m talking finesse crafted out of steel. I still can’t wait for mine! Thanks – Dynagroove. Just ordered a copy of the BBS Documentary. So happy to both learn more about my beloved BBSes and help out Schuyler. Thanks, Jason! I’m interested in making a straight donation to this effort, but a small amount. Is there a PayPal account or something for this?